The shoe is very flexible and fast, based on some reviews. Some runners found this shoe very versatile. Runners were impressed with the grip of the shoe, which is effective on soft and hard surfaces. The Synthetic mesh in the upper, coupled with a Met Cradle webbing, secures the foot well while maintaining a well-ventilated interior environment. It has the DWR coating that’s water repellant, keeping the foot dry while running on wet surfaces. The mid-sole unit delivers responsive cushioning and propelling mechanics to make each step more empowered. The X-Talon 212was too narrow to some testers. The medium level of cushioning left some runners wanting more because they apparently experienced discomfort during extended use. 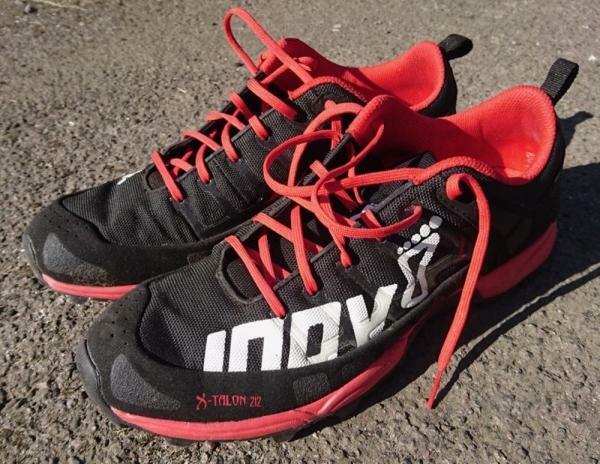 The Inov-8 X-Talon 212 is a racing shoe that can handle both soft and hard terrain. Aside from being a reliable mid-range racing shoe, this shoe doesn’t disappoint when it comes to hiking and obstacle running. It offers a good combination of durability, speed and protection that’s reliable and competent. The Inov-8 X-talon 212 saw the light of day in 2008. It revolutionised the market for trail/fell running shoes. Today, ten years later, it is still marketed in pretty much its original form apart from a few color changes. That is a testament to its original qualities. I will in the following try to explain why I (and many others) find the X-Talon 212 so good. Please note: I am not affiliated or in any way paid or rewarded by Inov-8 for this or any other review. When the first X-Talon 212 came out it was yellow, black and dark grey. Since then a range of other colors has been available. The overall design/theme has been the same all along. Darkish outsole and upper with neon/bright contrast color squares, stripes and other markings. The present X-Talon 212 is grey/dark grey and neon yellow. I would not call the design beautiful or stylish. The design is in many respects ugly, but it is very distinct and once you've become a fan you'll quickly spot other fellow X-Talon'ers. I think true fans tend to look past the weird neon blotches and see the signature design of a high-quality shoe. The X-Talon 212 comes with two different lasts: "precision fit" and "standard fit". The standard fit was discontinued some time in 2016/2017. If you are lucky you may still find the odd left-over on obscure corners of the internet or at your local shoe store. The precision fit is a narrow last that does not leave much wiggle room for the foot - especially the forefoot. The advantage of this very tight fit is outstanding control. The disadvantage is squished toes - particularly if you (like me) prefer long slow runs. For people with wide feet, the precision fit is simply not an option. The precision fit X-Talon is true to size, so I tried to go up half a size to get extra space for the toes. The tiny amount of extra space you get is, however, outweighed by overall misfit (the proportions somehow gets wrong). What has helped me the most with the precision fit X-Talon is leaving the foremost laces loose. That way the front of the shoe is allowed to widen a bit and adapt to your feet. Still, the precision fit is indeed narrow and gets too uncomfortable for me when I go beyond an hour and a half. The standard fit has a bit more toe-splay-space (not much though) and provides a less tight overall feel. This allows you to go for longer runs. I've found the standard fit to be suitable even for ultra trail runs. In my opinion, you do not lose a whole lot of control because the fit is still tight - a nice "foot hug". Please be aware of a weird sizing issue: The standard fit X-Talon comes half a size small. The feel of wearing the X-Talon 212 is of course highly personal and depends on how your feet are built and how you like your shoes tightened. I started out with the standard fit X-Talon and found them to be the most comfortable shoe I've ever tried. They fit immediately from run one and the tight yet smooth "shoe-hug" feeling only became better with milage. Almost moccasin-like. The key to the comfortable fit of the X-Talon (regardless of last) is that the shoe is very flexible. The outsole upper, tongue ... the lot. Despite its extreme flexibility it still provides plenty of support and feels very secure. If properly tightened you do not need to worry about losing your shoe - no matter the suction capacity of the mud/bog/fell in which you are running. The outsole of the X-Talon holds 8 mm squarish lugs that are angled slightly in all directions. This provides unrivaled grip in pretty much any condition from sandy beaches to the most slippery of mud. The material is soft(ish) providing excellent grip on rocks too. The only situation in which I have felt insecure was on solid, packed ice. For this, the X-Talon is not the best, but you'll get through. Mind you, the ice-slippage gets worse with outsole-wear. Please note that due to the size of the lugs the X-Talon do not go well with "ice-add-ons" such as YakTrax. The X-Talon is a trail shoe. A trail shoe built for extreme conditions. However, in my experience, they do equally well in most other trail conditions. From dry hard packed trails over gravel roads, beaches and sand dunes to mud, riverbeds, forest, and mountains. The X-Talon does it all - and does it well. You may not take full advantage of the aggressive lugs on all surfaces, but you still have a smooth and comfortable ride. I have also done a fair bit of road-to-trail type stuff for "transportation purposes". Looking at the shoe - aggressive lugs and minimal cushioning - you would think running on roads is torture. It'snot! The lugs and outsole of the X-Talon are soft and tend to "give way". To some extent, it feels like an extra layer of wobbly cushioning. Did anyone say "On CloudVenture"? Mind you, the X-Talon is not built for roads and you can almost feel the lugs grate away on the asphalt. I tend to run on the shoulder of the road to spare my body from road-impact and reduce wear on the lugs. There is no rock plate. You get a nice close-to-the-ground feel and sense the track through your feet. In my experience, it is not an extreme shoe in this regard. The rubber outsole provides plenty of protection from hard rocks and sharp edges. I have had no problems what-so-ever with underfoot-protection. The upper is made of a very solid Cordura-like fabric that withstands an incredible amount of abuse. I did well over 1200 km of rugged trails in my first pair of X-Talon 212. The lugs on the outsole were mostly gone, there were plenty of holes in the within-shoe fabric, the laces were broken and I had gone through the insole. The upper was dirty but still intact and fully functional, albeit less water repellent. The fabric is tightly woven and prevents grit and sand from getting into the shoe. Used with suitable gaiters you'll rarely have trouble with gravel/sand/grit. The only time I have experienced "stuff" going into my shoe is on muddy runs when tiny clay-particles make their way in along with the water. This has had no adverse effect on comfort though. I'd almost say that combined with gaiters the X-Talon is suitable for long-distance hiking/tramping adventures too. Mind you there is no ankle support! The only disadvantage of the tight upper material is lack of ventilation. The X-Talon are rather warm, which is an advantage in cold conditions. I have run for several hours in up to half a meter of fresh powder snow. My shoes were completely soaked from melting snow, but my feet still felt warm and comfortable. In the summertime, the heat-retaining capacity is not an advantage and I tend to pick other shoes unless I really need the grip. At the front and sides of the shoe is a sort of harder toe bumper, which will protect your feet a bit from rocks and roots. Mind you the X-Talon 212 is not a safety boot. It's a very light trail shoe. It will protect your toes against some hardship, but if you go around kicking tree stumps you will still break your toes. I find the amount of protection quite sufficient and very much in tune with the rest of the shoe. As mentioned above I did more than 1200 km in my first pair of X-Talon 212 standard fit. Considering the amount of abuse they got - water, mud, rocks, roots - it is incredible that they lasted for that long. They are in my mind excellent value for money, and if you browse the web you may find last years model (colors) available for cheap. I recently got myself a pair of X-Talon 212 precision fit for a measly 50 euro (including delivery). The X-Talon 212 is a light-weight, low-stack, low(ish) drop shoe. They may not offer much in the cushioning/"bounce-back" department, but they counter that by offering superb grip (very little slippage), excellent ground feel and speed. To me, trail running is not about speed, but enjoyment and pushing myself farther. Because of the low slippage and good control the X-Talon 212 is also superb for that kind of running. On several race-like occasions, I have seen other runners struggling for grip and spending huge amounts of time and energy just to stay upright. I quietly plodded along in my X-Talons in my usual (slowish) gait and conserved energy. Whether you want to use that conserved energy for going faster or in my case going longer and enjoying the run is a personal matter. Your choose! In hindsight what makes this shoe so great is that all features are in tune. The toe bumper, the lugs, the upper, the tongue, the insole - it all somehow fits together to make up "a nice rounded unit". What good are deep lugs if the fit is loose? What good is a tough upper if you never get to rugged conditions because the underfoot protection prevents you from running anywhere but smooth park tracks? The X-Talon 212 is so good because all aspects are equally tough and built with the same purpose in mind! If you haven't tried them before and are in the market for a proper trail/fell shoe - make sure to give them a try. They are simply one of the best and also versatile shoes out there. I recommend trying them on before you buy, because sizing may be odd. Also, the precision fit last may be too narrow for you. Are you ordering over the internet; go true to size for the precision fit, and half a size up for the standard fit. If you are used to cushioned high-drop shoes you should take it easy - the X-Talon may not be for you. The Inov-8 X-Talon 212 is an excellent, light, fast, durable, rugged trail shoe that will serve you well for many miles on most type of trails. They provide very little cushioning, good ground feel and a reasonably low drop (6 mm). You get unrivaled grip and control even in the most slippery and highly technical conditions. All in all, a huge thumbs up from me! I get the question a lot, of which shoe is great for Tough Mudder or other obstacle course races, and I have to say, of all the shoes that I've reviewed this one's definitely up there. And I think that's why it was designed and who it's geared for. Extremely lightweight, extremely grippy… held my foot in place pretty well. A good shoe for going out, for going fast. The X-Talon 212 really is a top quality shoe with a very specific use. The all new Inov-8 X-Talon 212 features a combination of fast, light and natural running experience. It weighs only 212 grams and it has enough amount of flexibility. The overall design of the shoe delivers an increased speed for different running distances. The upper of this Inov-8 shoe uses a durable water repellent (DWR) coating that keeps water from entering the shoe without affecting the overall breathability feature of the shoe. The X-Talon 212 has a standard running shoe size. The heel, midfoot and forefoot are of standard measurements, comfortably accommodating those with regular foot shape. The brand offers two widths fitting. One is the precision fitting or the narrow fit and the standard or the wider fit. The outsole unit of the X-Talon 212 delivers an impressive all around grip. It is designed to hold on soft terrain and grip firmly on harder terrain. The aggressive lug pattern made the shoe ideal for loose rock or muddy surfaces. It also comes with Meta-Flex groove that is strategically located in the forefoot area to encourage natural foot movement, giving flexibility during toe-off. The brand’s 2 Arrow Shoc-Zone was used in the midsole to provide medium underfoot cushioning. It offers a combination of underfoot protection and responsive cushioning. The midsole also uses the Dynamic Fascia Band that efficiently releases energy in every step, helping runners to run faster and more efficiently. The upper is coated with a durable water repellant coating, providing a water-resistance capacity without sacrificing breathability and comfort. The shoe also utilizes the TPU Lacing System that provides added support and a more secured fit. It added to the solid and stable feel of the shoe.